I wish I could brag to you about the abundance of my sweet corn crop this year. Our sweet corn was a total failure. Between the wind and heat and my lack of care...we have no corn to pick. I weeded one of the nine rows one day and then gave up. Maybe that was part of the problem! Thankfully my father-in-law takes much better care of his garden. And he is so generous that he planted enough corn for everyone to be able to have some. Joel's family is big...so that means he planted a lot of sweet corn. Levi and I went to help freeze all the sweet corn last week. They picked and husked it and Levi helped load up the wheel barrow. I helped with the cleaning. It was much cooler to have your hands in a tub of cold water. It has been SO HOT in Kansas this summer. Levi and his little cousin liked playing in the water too. It took a long time to rinse off all of the corn and I wasn't even there when they first started. Thankfully there were many hands helping. I'm pretty sure we went through at least three wheelbarrows of corn. Levi never ran out of ways to keep himself busy. He thought cleaning his shoes off in the water would be a great idea. Here the corn is piled up and ready to go inside. Don't worry we saved plenty to eat fresh off the cob too! We cut all the corn off the cob and filled up the pots. we ended up with over 100 quart size freezer bags. There is nothing better than pulling out a bag of sweet corn in the middle of the winter. Cook until boiling and then let corn simmer for 10 minutes. Cool kettle in cold water for several hours until corn is completely cooled. Bag and freeze. but such a fun day hanging out with Joel's family. Of course there were cookies involved too. 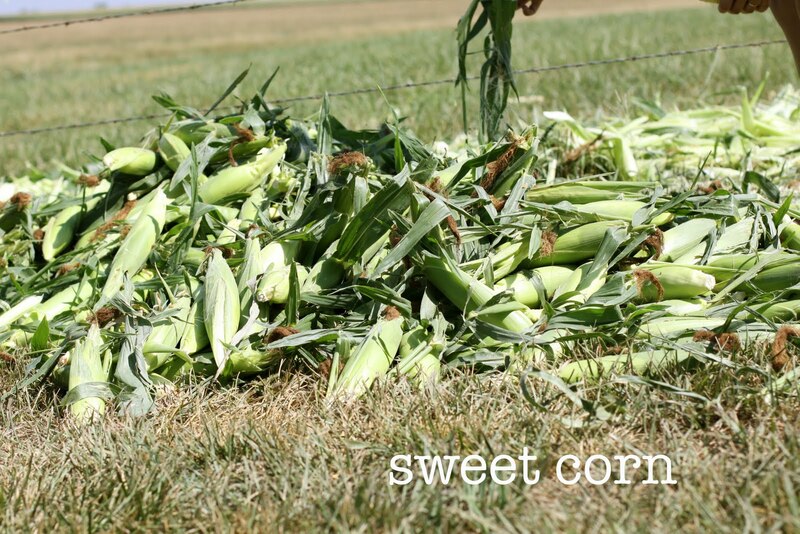 and lots of sweet corn. and for so generously sharing with all of us! oh my gosh, I love the pictures of him eating corn! Hilarious! LOVE the pictures of Levi eating the corn! being from los angeles, farming corn like this is so foreign to me....but so neat! Just love reading your post!!! Thanks for the corn recipe!! I love this. It reminds me of my Grandmother. She doesn't grow corn, but buys it in bulk and freezes in bag. I've done it a few times, but hope to keep it up for my family. This was a sweet post. I don't know how well our sweet corn is going to do either. We plant about 16 rows each year. We had such a late wet spring that it is no where close to being ready. Looks like loads of fun! cutest post ever - levi eating corn made my night! The corn recipe sounds A-mazing! Also, the pics of Levi goin' to town on it... priceless. That looks so good! We love corn & grill it every time we fire up our grill. Sweet corn is a gift from God!! The pics of him eating the corn are just so darn cute!!!!! And you are looking beautiful! I am SOOO jealous. I have been privately following your blog for some time now but this post made me so happy. See, I'm a Texas girl and we don't have sweet corn like y'all. My best friend's grandfather had corn fields in Illinois and every year they would come in town and we'd eat TONS of that sweet corn. We all cried when he sold his tractor and equipment three years ago. Last night as I heated up my frozen corn from the store, I was actually thinking about how much I miss that fresh sweet corn taste. I'm glad you are getting to enjoy it!!! our sweet corn isn't quite ready yet - maybe another week. We've had bad corn luck the past couple of years - one year it just didn't come up...another year it came up but didn't pollinate so we had ears but no kernels on them :( Not sure how my hubs is such a great farmer but sweet corn is such a downfall! Just when I think you have posted the cutest picture ever of Levi, here comes the corn on the cob photo! He is such a boy. Yum! I helped my grandparents-in-law do 24 dozen ears a few years ago. It was a lot of work, but so yummy. Levi is starting to look more and more like a little boy! I can't believe how big he looks by the wheelbarrow. Thanks for the recipe, Jess! We planted a lot more corn this year and it should be ready here in the next week or so. We had talked about canning some of it, but this seems like a much easier way. We'll also freeze some of the ears. Already been making pickles (well, my stepdad started, I haven't done any yet). We have similar pictures of Emmy from this summer. We were eating the last of last years crop and she LOVES corn! G'pa gave her a small ear, but she looked over at G'ma and then stole her big ear! Can't wait to taste this year's crop. It better be good b/c it was a HOT day when my cousin Bobby & I planted it. I so love pictures of babies enjoying corn on the cob. I hope that Kansas heat takes a break! My family back home has been telling me how sweltering hot it is! I found the best tool for taking that corn off the cob. Pampered Chef has it! It is designed just for that purpose. It cuts it right at the cob to you get the whole kernel and it is sooo simple. I love it! Just thought I'd mention it because I find it easier and a better cut than a knife, especially doing that many ears. Look at him go! Eh...there is always next year....but what you did have....looked sooo amazingly good! nothing better! I saw this on some random site tonight and immediately thought of this post! Too bad you didn't have a few of these to help with all that corn. So funny! We moved to Iowa about 4 weeks ago, and I just shucked my first batch of sweet corn last night!!! It was so fun...and SO YUMMY! I can't wait to make a ton for the winter!! ps - Levi eating that corn is PRECIOUS! !